Amazon ads Action cameras size comparison - NEW! "It's like holding a camera without holding a camera!" "Invaluable tool for online shoppers!" " It'll definitely save a lot of time.."
"..None is as comprehensive or detailed as this." Camera size is a web app which allows you to compare two different digital cameras side by side and comprehend the relative physical size differences between them. Furthermore, you can view the life-size physical dimensions of the camera on your LCD screen, as if you were looking at it at the camera store. 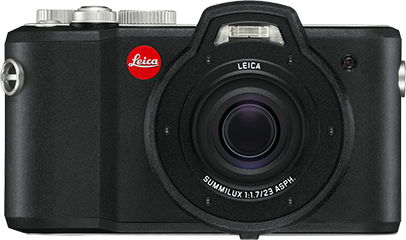 The camera's list is being updated daily, including mirrorless, DSLR and point-and-shoot digital cameras. Discliamer: Certain content that appears in this application/site comes from Amazon Services LLC. This content is provided 'AS IS' and is subject to change or removal at any time. FujiFilm, Canon, Nikon, Samsung, Kodak, Olympus, Pentax, Casio, Sony, Leica and Panasonic's logos are registered trademarks in the United States, other countries, or both. Designated trademarks and brands are the property of their respective owners. 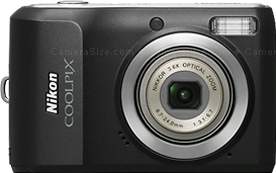 Compares size of cameras relative to other cameras and also life-size views of digital cameras. Best viewed with latest browsers. Camera dimensions are for body only (excluding protrusion), without interchangeable lens or with a lens extended as specified by the specs on the vendor's official website. The faded text in the image is watermarking and not part of the camera itself. By accessing or using our service, you agree to be bound by the terms, and conditions set forth herein (see terms and conditions link below), and acknowledge that you understand all terms including the disclaimer statements. If you do not agree to be bound by the terms and conditions of this agreement, you are prohibited from accessing or using our service. We may modify this agreement at any time with or without notice to you, and such modification will become effective immediately. Easy & Fast Mobile Sharing! Share this link with your friends. This will direct them straight to this specific comparison.